Kaffir lime plants, also known as Citrus hystrix, are an attractive citrus plant with shiny double leaves which impart a very pleasant lemony aroma. During the summer months a healthy kaffir lime will also develop a white blossom which often turns to fruit. The zest of this fruit is often used to help create a paste for Thai and other curries. The kaffir leaves themselves are used extensively in many forms of far eastern cuisine. Our plants come in two sizes and will be delivered direct to your door by next working day courier and come with full instructions and recommendations for their care and maintenance. We also take pride in the after sales service we offer at no extra cost to our customers. If you have issues with your plant we will be happy to assist you. Why buy your own kaffir lime plant? Plants bring great joy into the home. A stark, plain and otherwise demure room can instantly be enlivened by the emerald green of a gorgeous plant. Kaffir lime plants are especially nice to have thanks to the rarity of available fresh kaffir lime products. As long as you give your plant the care and attention it needs, you will be gifted with an abundance of fresh kaffir lime leaves and fruit which can be used for a great variety of things. Cooking with fresh kaffir limes and leaves is a particular joy. They impart an amazing zesty, aromatic, citrusy and bitter flavour to whatever is cooked with them. Thai and other oriental cooking is particularly well suited to the unique flavour. A kaffir lime tree would make an unusual and exciting Christmas gift for avid gardeners or plant lovers. We can send plants direct to your loved ones ensuring no prices are quoted on included paperwork. See what customers say about our products and service. You will receive your potted kaffir lime from us already planted in the appropriate potting soil mix, but if and when you need to add fresh soil to the top or pot up to a larger container you will need to use the right mix of ingredients to keep your plant happy. No citrus plant enjoys wet feet, so be sure to use a fast draining potting soil. There are many brands of citrus potting soils available for sale at garden centres, but if you create your own potting soil be sure to add about 20 per cent grit by total container volume. The base of your potting soil mix should largely be composed of compost with some topsoil mixed in. Kaffir lime plants benefit from the addition of trace minerals to the potting mix, but remember that less is more. Indoors during the winter, water your plant once a week or less depending on how fast the soil dries out between watering. Kaffir lime plants hate wet feet and are prone to root rot so do your best to avoid overwatering. Generally, if you can stick your index finger up to the second joint into the soil with no sign of moisture, then you can safely water again. If possible use tepid rainwater. Keep up humidity by misting plants daily and keeping the pot on a stone-filled tray with water. During the summer, water whenever the soil feels dry 3cm down and use rainwater when possible. 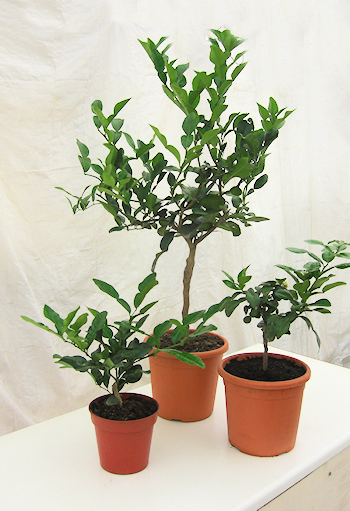 Citrus plants adore sunlight and that applies to kaffir lime plants as well. Native to Southeast Asia, these plants greatly appreciate as much light as they can get. Once temperatures begin to regularly drop below 5C in the fall, bring your kaffir plant indoors and place in a well-lit area: a conservatory or bright window would be ideal. Try to keep it in a cool but bright spot that is away from draughts. When temperatures warm again to between 12C and 15C, you can bring your potted kaffir lime out to a bright spot in the garden if you desire. Mature plants can survive very short periods down to 0C so long as the root ball does not freeze. Kaffir lime plants need minimal pruning. In late winter to early spring, thin overcrowded branches for good airflow and light penetration. In the summer pinch off the tips of branches that are growing most vigorously to keep your plant in a bushy habit. Citrus plants are greedy, so it follows that kaffir limes are as well. During the summer feed your lime plants with high nitrogen feed weekly. During the winter feed with high phosphorus and potash feed bi-weekly. Need more information or help ordering your kaffir lime plant? Get in touch with us. We would be happy to answer your questions, whether about the ordering process or about taking care of your new Colonial Growers' kaffir lime tree. We pride ourselves on our service both before and after sales. We now offer yuzu plants for sale to UK customers as well. Be sure to have a look.